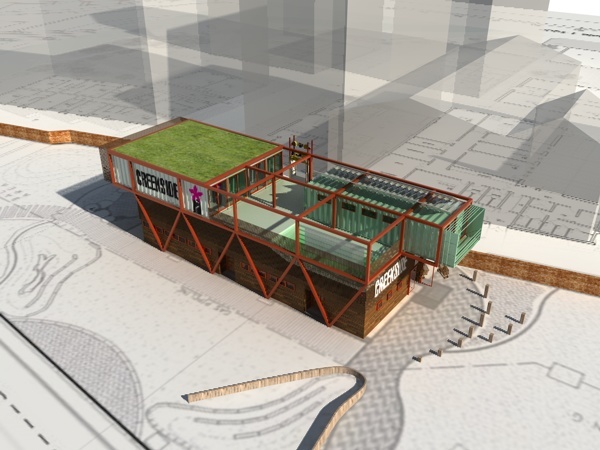 Planning has been granted for a bold new extension to the Creekside Discovery Centre within the Deptford Creek Conservation Area of Lewisham. The Centre is run by local charity Creekside Education Trust who helps people of all ages and abilities to enjoy the physical and natural environment and help maintain and protect the local urban wildlife on the site and along Deptford Creek. The repurposed building seeks to minimise the impact of expansion on the wildlife habitats in the site by using a playful portal frame that spans over the existing building to support new facilities. Recycled shipping containers are plugged into the frame to make new teaching and ancillary blocks, which double the buildings occupancy. A carefully laid out podium deck also provides a unique outdoor education experience with a sunken auditorium, over the top of the existing roof, that provides an elevated vantage point for visitor’s to view wildlife habitats across the site. The exposed structure and raw materials are inspired by the local context and aim to preserve some of the industrial character of the area.